This application uses a widget-based layout, at any time you can add or remove widgets from your dashboard and use the other controls to select the system you would like to analyse a long with its version. In the toolbar of the application there is also a dropdown containing all of the different visualizations you may add to your dashboard. Selecting any of the visualizations will add a widget to the dashbaord for the given visualization type. For all widgets you can remove them by clicking the 'X' in the top left corner, you may also resize and drag them to any given location on the page. 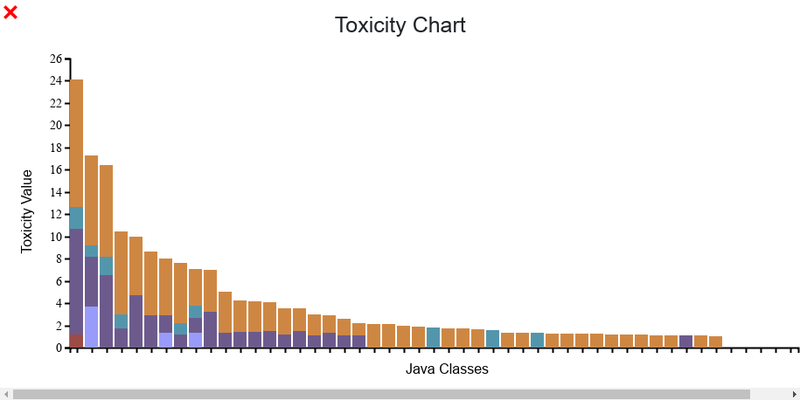 The toxicity chart visualization is a stacked bar chart which shows a bar for each class of the system which violates a set of metric based principles. For each principle violated the bar is given a corresponding height and this makes up the combined height. This chart can be scrolled horizontally if there are too many classes in the given widget size. Hover over the bars to see how they violate given metrics and to view class info. The dependency chart is a chord graph and links from each class to any class which it has a dependency on. Hovering over any of the classes will highlight only the classes which are a dependency of the hovered class. 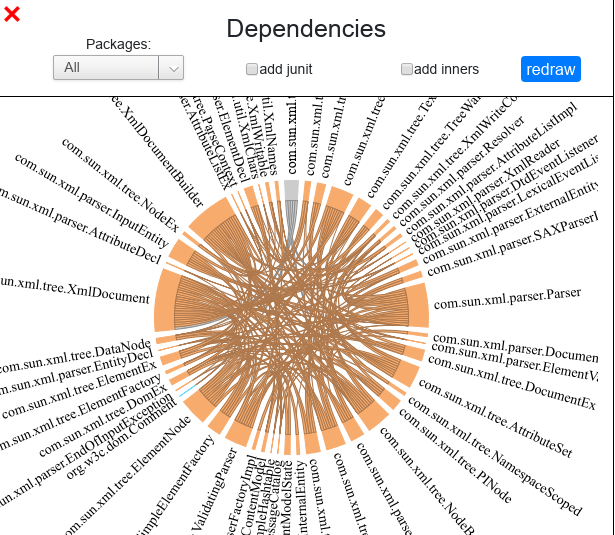 In the toolbar of this chart there is a package dropdown which wil allow you to select to view only dependencies within a given package, as well as checkboxes to add inner classes, and junit classes to the visualization. Sometimes you may find that the given system has too many dependencies to show this chart type and so it must by filtered further with the given options. 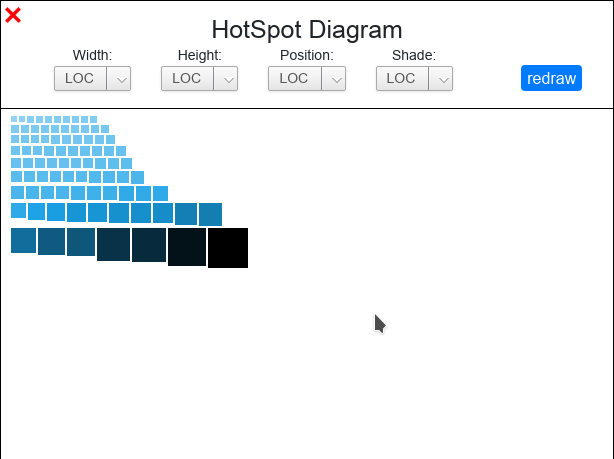 The hotspot chart is a polymetric view chart which shows a single rectangle for each class. The properties of the rectangles are determined in the toolbar, for each property you choose: Lines of Code (LOC), Number of Methods (NOM), Number of Public Methods (NOPUBM), or Number of Fields/Attributes (NOA). 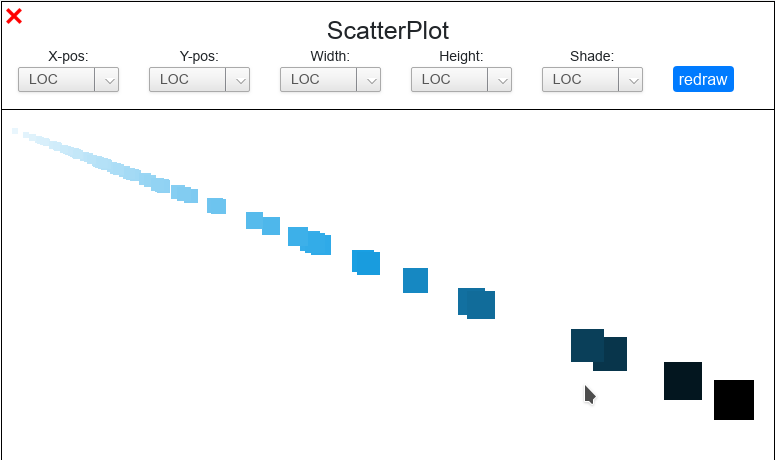 The scatterplot chart is a polymetric view chart which shows a single rectangle for each class. The properties of the rectangles are determined in the toolbar, for each property you choose: Lines of Code (LOC), Number of Methods (NOM), Number of Public Methods (NOPUBM), or Number of Fields/Attributes (NOA). 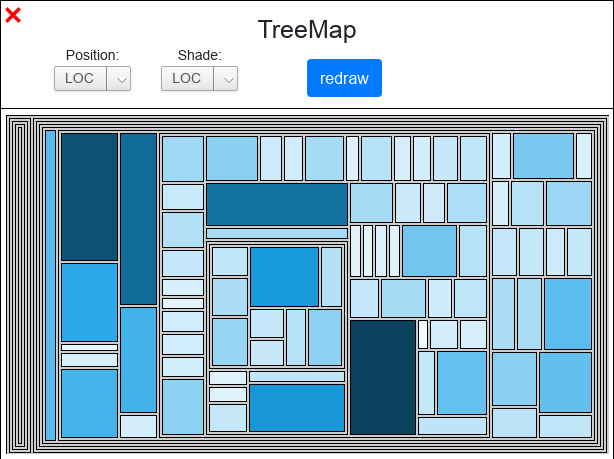 The treemap chart is a polymetric view chart which shows a single rectangle for each class, the class rectangles are placed within grey rectangles which represent the package hierarchy which they are in. The properties of the rectangles are determined in the toolbar, for each property you choose: Lines of Code (LOC), Number of Methods (NOM), Number of Public Methods (NOPUBM), or Number of Fields/Attributes (NOA).